Zoya is planning something big to kick off your holiday shopping this year! Nail Polish Dreaming reaches new heights this holiday season with the release of Zoya Dream Boxes, curated nail polish color combinations delivered in deluxe black gift boxes of three (3) and six (6) or simply order a box and fill ‘em up yourself, with over 300 gorgeous hues, the possibilities are almost endless. Pssssst.... they make a gorgeous gift when stacked tall too! Zoya DREAM BOXES - TRIOS: $24 EA. Amazing trios custom curated for you by the color experts at Zoya. ZPDRMBX1301 - Zoya Tinsel Time: includes Zoya Ziv, Storm and Trixie. ZPDRMBX1302 - Zoya Glittering Gift: includes Zoya Storm, Payton and Blaze. ZPDRMBX1303 - Zoya Fireside Chic: includes Zoya Black Swan, Casey and Sam. ZPDRMBX1304 - Zoya Oh What Fun: includes Zoya Aurora, Dream and Logan. ZPDRMBX1306 - Zoya Warm Wishes: includes Zoya Maria Luisa, Sarah and Asia. ZPDRMBX1307 - Zoya Merry and Bright: includes Zoya Alegra, Ivanka and Charla. ZPDRMBX1308 - Zoya Ice is Nice: includes Zoya Ziv, FeiFei and Daul. ZPDRMBX1309 - Zoya Rosey Cheeks: includes Zoya Kerry, Tinsley and Bobbi. ZPDRMBX1310 - Zoya Cozy Cashmere: includes Zoya Nyx, Vespa and Godiva. ZPDRMBX1311 - Zoya Starry Night: includes Zoya Tomoko, Dahlia and London. ZPDRMBX1312 - Zoya Sparkling Lights: includes Zoya Carter, Sunshine and Arabella. Zoya DREAM BOXES - Six PACKS: $48 EA. Amazing six packs of color in deluxe black gift boxes. ZPDRMBX1313 - Zoya Keep it Cozy: includes Zoya Flynn, Hunter, Livingston, Mason, Neve and Channing. ZPDRMBX1314 - Zoya Sugar Rush: includes Zoya Tomoko, Dahlia, Chyna, Arabella, Carter and Sunshine. ZPDRMBX1316 - Zoya Festive Favorites: includes Zoya Maria Luisa, Storm, Kissy, Blaze, Aurora and Mosheen. Order the box and fill it up with three of your own polish picks. $24 (US). Order the box and fill it up with six of your own polish picks. $48 (US). 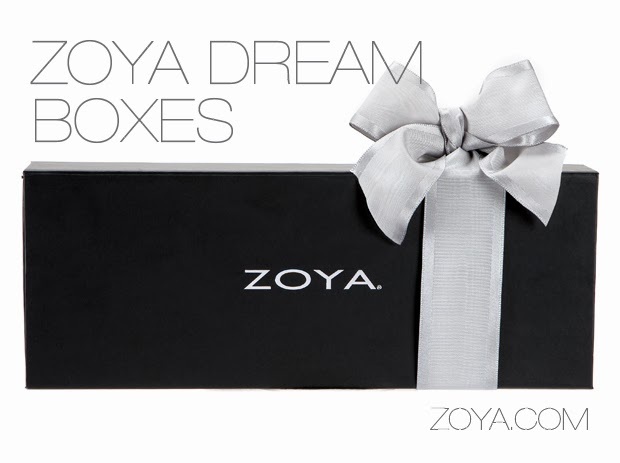 Zoya DREAM BOX - TWELVE COLORS: $96 EA. The big box! Loaded with 12 fabulous colors in a deluxe black gift box. ZPDRMBX1315 - Zoya Cheers to All: includes twelve (12) colors - Zoya Ziv, Anaka, Sarah, Rekha, Dakota, Stacy, Payton, Dream, Timo, Black Swan, Noot and Cassedy in a Mega Deluxe Dream Box. Zoya Dream Box - Cheers to All. *Available with any $72 purchase on Zoya.com. Includes 12 piece Zoya “Cheers to All” Gift Box (above), Zoya Color Lock Mini plus FREE shipping. Over $118 Value! VALID 6PM EST 11/28/13 until 11/29/13 11:59PM EST. ONLY. 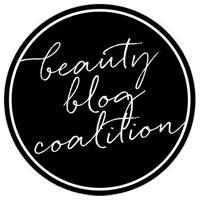 Wow, I love the Dream Box idea and the Dream Big Offer is amazing! 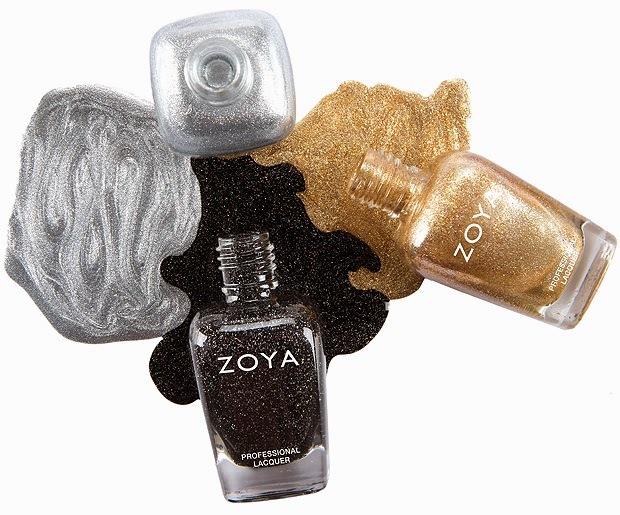 Will Zoya be on your holiday shopping list?